Who will not be shock about what happened few weeks ago at Manila Peninsula? It's front door was smashed by a military tank where Sen. Trillanes and his companion were inside. A curfew was imposed that night and many have been stranded going home from work esp. in Makati area. Anyway, we are all thankful that no one is really hurt. 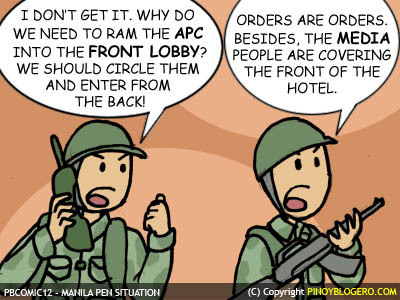 Here is a cartoon of Manila Peninsula Incident drawn by my nephew KARLO (Pinoy Blogero). He is back from blogging now and back in making great drawings.